How to Take Your Student's Learning into the Sun! Summer Doesn’t Have to Be All About Video Games and TV! If you have been looking for activities which you and your student can enjoy together which don't involve sitting in front of a TV, The Tutoring Center, Sandestin is here to help with some great fun and educational activities to get you all out of the house enjoying the sun and learning! If your student doesn’t enjoy writing it could be that the only exposure they have to the task is being told what to write about at school. Change this up by taking them to the local park for an enjoyable picnic. Once you have all had a play on the equipment (yourself included), get out some paper and pencils and get to writing! Have them write about anything and everything they like, such as a diary entry for the day’s events or even a short story about a character they made up or have been reading about. This can help to build a positive connection with writing and can also help you identify any grammar or spelling challenges they may be experiencing. If it’s reading that your student doesn’t enjoy, it could be for the same reason. After all, reading nothing but school books isn’t very exciting! Instead, keep the above picnic idea but, before you get to the park, stop by a local bookstore and pick up two copies of a book your youngster chooses. 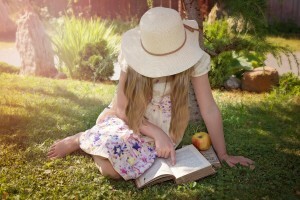 Once you are settled on your picnic blanket and have full stomachs, relax by reading the books. However, instead of just reading until you both feel tired, read chapter by chapter, stopping in between to discuss where you think the book will go. You can even create small wagers with the person who predicts the next chapter correctly winning a small treat. If you notice that your student struggles with their spelling or has trouble reading some common words, tutoring can help. Speak with a learning professional at The Tutoring Center, Sandestin by calling (850) 424-7935. Find out more about the benefits of tutoring and book your free initial diagnostic assessment.